A little over a year ago I received a phone call from a Red Cross friend and colleague, Dr. Suzanne Horsley, asking if I would be interested in joining her in applying for a Page Legacy Scholar Grant from the Arthur W. Page Center for integrity in public communication. This particular grant takes the bold approach of pairing public relations practitioners with public relations academics. It is a great way to bring real world experience and research science together. First off, I found out that collegiate researchers answer to an institutional review board (IRB) that makes sure that their research is ethical and that humans are protected from physical or psychological harm while being studied. This seemed like a good thing to me and I was happy to have this type of oversight to ensure that we didn’t somehow slip into a dystopian research scheme. Thanks to direction from the IRB at the University of Alabama, I had the privilege of taking, and passing, a National Institute of Health online training course where I learned the many ways I could inadvertently cause harm while researching humans. Fortunately, our research method was participatory interviews, so there was little or no chance that I could cause any kind of harm to humans…or animals. Because I chose to focus my portion of the research on two disaster events I had personally participated in, I smugly assumed that I would be able to find a multitude of participating communications professionals who would be willing, eager even, to talk to me about their experiences. Initially I reached out to former Red Cross colleagues with great success. Several were happy to schedule a time to talk with me! Then I sent them the pre-interview questionnaire. In the interest of full disclosure, I should tell you that I have spent hundreds of hours helping my clients procure testimonials from their customers. We’ve found people love to talk about how great you are, but when it comes to writing it down…crickets. I understand all the reasons for this; writing is drilled into us at school as something that must be perfect before it can be released into the wild. If you are a communications professional you suffer from this belief to the tenth power. So I knew I was asking a lot of those brave souls who had agreed to be interviewed by me. There is no doubt though, that those questionnaires were incredibly useful. They led to additional questions and insights that would most likely have not been uncovered if the exercise of filling them out hadn’t given interview subjects the time and space to consider those details. I know, because I filled one out myself on the theory that I shouldn’t ask someone to do something I wasn’t willing to do myself. Then there was the passage of time, for example one of the disasters I researched was the Oklahoma City Bombing which took place more than 22 years ago. At this point in my life, remembering what I did last week is a challenge, asking people to recount information about events so far removed is a serious test of recall. The other issue with the amount of years that had passed was the difficulty in finding additional subjects to interview. I tried a variety of sources and used many resources to track down people who had served as communicators during those two tragedies. I was ignored, rebuffed (albeit nicely) and stymied at nearly every turn. I also discovered that there were far fewer professional communicators in the disaster field 22 years ago. Many potential subjects had died, others proved impossible to locate. I learned that being an academic-type researcher means having a tenacious ability to keeping going moving forward even after rejection after rejection. I have to admit, even after conducting exhaustive research (I have the spreadsheets to prove it! ), I felt like a failure for not being able to find more people to interview. Fortunately, after several months of silent suffering, I admitted to my research partner and friend that I wasn’t achieving the glorious results I had expected. She then told me several stories of her own lack of success in finding and procuring interview subjects. Sadly, this cheered me to no end to know that even with her superior research skills and years of experience, she too, sometimes hit roadblocks. In the end, the insights and ideas that I collected from those that I did interview were profound and illuminating. As they say, it is the journey that matters and I now understand that many of the lessons I learned during the research process were impactful and applicable to my own life. My appreciation of the many academic researchers who spend countless years investigating this amazing world is truly unparalleled. This project was supported by a Page Legacy Scholar Grant from The Arthur W. Page Center at the Penn State College of Communications under Page Legacy Scholar Grant. Any opinions, findings, and conclusions or recommendations expressed in this material are those of the author(s) and do not necessarily reflect the views of The Pennsylvania State University. I live in a historic, well really just old, house. It was built in 1920 and challenges us weekly with quirky things that are the result of many different people living and working on this house over the years. This summer I decided that I wanted to paint the exterior of my abode, so I spent some time with my husband picking out colors and trying them on for size. We eventually landed on a combo that we thought served our Craftsman-style home well. Good prep work is required to make sure the paint, or a referral, will stick. With the colors all picked out, I was ready to paint. Just hand me a brush! Tools: Now is the time, before you start any actual work, to assemble all the tools you may need to do the work, such as business cards or brochures. Clean: Do a little ‘rolodex” housekeeping and make sure you have the most accurate and up-to-date info on anyone you plan on referring. Fill: Make sure that any possible referral holes are filled by having a one-to-one meeting with your fellow BNI member before you refer them. Sand: Knock off any rough edges or sticky spots during the meeting. Ask them to educate you on how to best refer them. For example some businesses may have set rates that they want you to share, while others simply want a warm introduction. After making the referral (or painting), it simply makes sense to go back and check your work. Were there any areas missed? Does something need to be gone over again? Making sure to check in with both parties is a sure-fire way to make your referral stick. We all love receiving a testimonial about ourselves or our companies, but have you ever thought about what goes into making a truly excellent and useful testimonial? Speak from a position of knowledge; you need to have used the goods or services before you can give a testimonial about that person or company. Be Specific. People want know how and why you used the product and how it performed. Be sure to include some basic details about your age and demographics. i.e. Forty-six year old, mother of two girls. If you can’t say anything nice, don’t say anything at all. At least in public. If you truly had a poor experience, take it directly to the company and let them know that you would like to offer them the chance to correct the situation. Don’t use a testimonial opportunity to lash out at someone else; it will only make you look bad. Short is sweet. You can give a great testimonial without giving two paragraphs of back story about why you decided to use the service. While people like to know a little bit about you, the point of the testimonial is to tell them about an excellent company or person. Put it in writing. The very best gift you can give a company or person is your testimonial in writing. Whether you write an online review on LinkedIn or speak up in a BNI or Chamber meeting, putting it on paper gives them something tangible that they can use to market themselves even better. Bonus Tip: One of the best ways to receive excellent testimonials is to give excellent testimonials. Use these guidelines the next time you want to give a testimonial and see if the good karma you generate pays off. Most BNI members understand that visitors are important to their chapter for a number of reasons—generating more referrals, providing access to new people and, most importantly, becoming new BNI members. But even though visitors are extremely important to the health of a chapter, many of us fail to take them seriously. 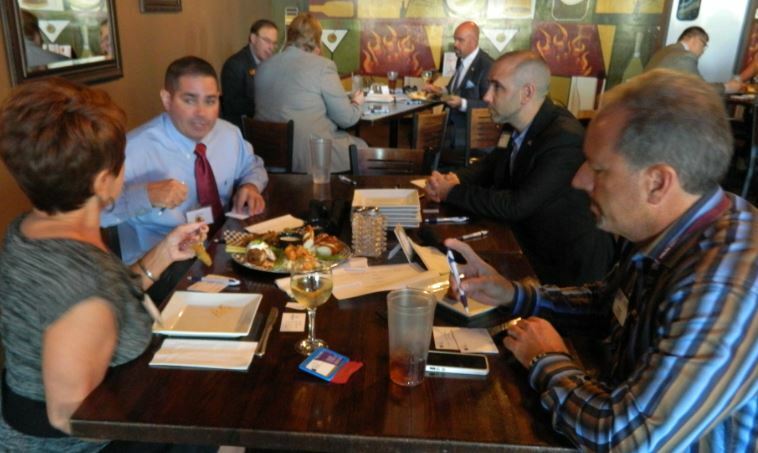 Visitors at a BNI meeting can bring valuable new connections to your chapter and your business. If I had a customer meeting that was 100 miles away from my home at 7 am tomorrow morning, do you think I would call to confirm that appointment today? You bet I would! I wouldn’t want to risk driving all that way before the sun was even up to find out that my customer needed to reschedule because of a work emergency. Yet, many of us fail to confirm attendance with our invited visitors the day before our weekly BNI meeting. Suppose, to take it a step further, I confirmed ahead of time, but when I showed up at that early meeting, my customer wasn’t there. What would you do? Of course, you would probably wait for the customer a few extra minutes and then you would call them to make sure everything was alright. Do you do that when a visitor doesn’t show up for a meeting? Or do you just think, “Well, it probably wasn’t a good fit for him anyway”? Lastly, after that meeting with an important customer, do you follow-up with a thank you email or note? How about someone who has taken the time and effort to visit your chapter? Call the day before to confirm the appointment. If someone doesn’t show up, call immediately to see if they are alright and find out why they didn’t come. Reschedule with them. Send a Thank You note or email. Get serious about your visitors and the business they represent, apply Actions that Achieve and increase your visibility, credibility and profitability in your chapter and business. My husband came home from a bike ride the another night with another story about someone who had nearly run him off the road and come perilously close to having caused a crash with two other cars. This, unfortunately, if not such an unusual occurrence. What made it stand out in his mind was this–there was a company name on the car. While he wasn’t very familiar with the local construction company named, he certainly has a negative image of them now. And here’s the thing, it has NOTHING to do with how well they construct buildings and everything to with his experience (unwitting or not) with one person. 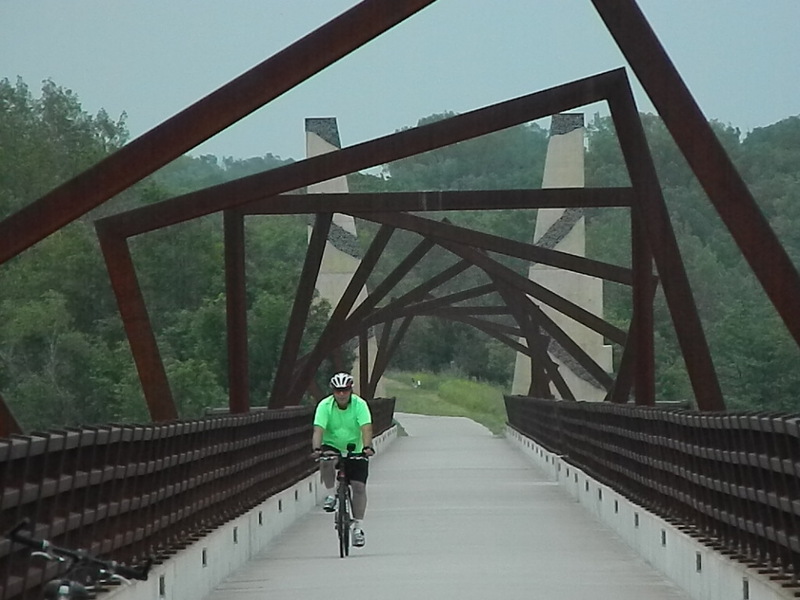 A safer place to ride your bike–the High Trestle Trail in Iowa. Do you think he’ll have good things to say about that company when their name comes up in conversation? While my husband is a nice guy, he’ll uncountably recount his ONE experience with ONE person from that company. Sadly, that company may never know the harm that one employee did to their reputation. I think we can all agree we may behave a little better under the watchful eyes of the boss. So how do you make sure that your employees are representing your company in an outstanding manner no matter where they are? A lot of it comes down to corporate culture and probably has as much to do with how the boss behaves and treats the staff as anything else. Show me a boss who cares for and supports their employees and I’ll show you employees who go out into the world and show that same care and concern to others. You really can’t BUY the positive Public Relations (PR) that comes when one of your employees stops the company car at the side of the road to help someone change a tire. It may not seem like a big deal, but those hundreds of cars flying past are filled with people who will notice and file that positive impression away for future reference. While it’s not the standard business school method for creating a PR plan, having a positive company environment and happy employees will go a long way towards creating the very best environment for a PR plan to flourish. So the next time you are thinking of investing in PR, start with your company culture and make sure that your people are delivering the company impression that you really want. 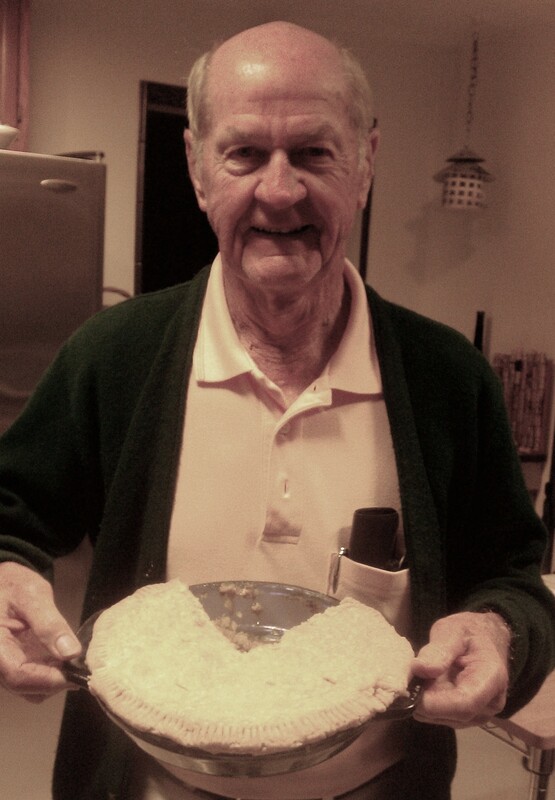 Uncle Jerry celebrates Pi Day. March 14 (3/14) or “Pi Day.” She was looking for some feedback on what kinds of PR might be appropriate. Since my friend has more than 20 years in the marketing industry, she’s no slouch when it comes to recognizing PR moments. But what about everyday business people who are so busy running their businesses that they barely have time to take out the trash, let alone think about PR? PR moments surround us, but it often hard to see them without a little guidance. These questions will help you generate a list of possible PR moments so that you can garner more awareness for you and your business. Grab a sheet of paper and use the next six minutes to put together your PR road-map. 1. What National Days might naturally fit with your business? For example, if you run a bakery you’ll want to mark National Cupcake Day (Dec. 15) as well as National Dessert Day (Oct. 14) on your calendar. And that’s just the start, there’s also days set aside for Oreos, Banana Cream Pie and Pi Day. Google “National Days” and see what opportunities exist for your business. 2. Does your City/Town/Village have annual celebrations? Make sure you put each and every local festival and parade on your PR calendar. There are always opportunities to raise your business profile by marching in a parade, sponsoring a contest or hosting a booth. If you happen to do it with a zany theme or to benefit a children’s charity, media will be delighted to hear about it. 3. Has your business been nominated for or won any awards? Don’t wait until you win! Even being nominated for an award is an honor and a press release to let the public know about it is perfectly legitimate. If the organization giving out the awards hasn’t created a release, you can build a little good will with others and mention all the award nominees in your press release. If you’ve won a coveted award, make sure the awarding organization has a professional photo of you or your business to send with their press release. 4. Do you or your employees have any unusual hobbies or collections? The media loves juxtapositions, so if you are a beautician by day and a roller babe by night, that’s the kind of “opposites” that make for an outstanding story. Bonus points if there are great visual elements to the story. 5. Is there a trend that you’ve been seeing in your business? One local business in our area has had eight couples become engaged at their facility in the past three years. Because the business owners generally know about the proposals in advance, it opens up some fun opportunities for that company to leverage the tenth engagement or an engagement that has unusual elements (like a singing mascot). Media is always on the lookout for emerging trends (why more people are doing public engagements) with great visual elements (a newly engaged couple with a singing mascot). 6. Is there an organization or charity that your business avidly supports? If you have a charity of choice, especially if you have a personal story that makes that bond tight, consider raising awareness and funds for that organization by hosting a special event or activity at your business. This is truly a win-win-win, with the media getting a great positive story while the charity and your business raise awareness. Take this list of PR moments that you’ve just generated and plan your PR for the year. I guarantee that taking advantage of all these precious PR moments will pay off big for both you and your company. My front yard is being re-landscaped so I can have running water! 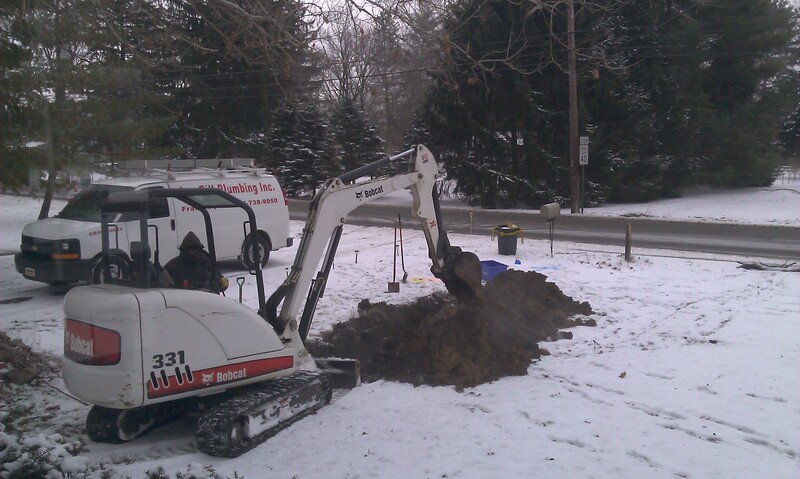 After more than a week without running water, I appreciate even more the privilege of living in a first world country. I never expected to be without running water for such a long period, but the unusually low temps in our area have prevented outside repairs. We’re lucky though, even though our water main is broken, it has just enough pressure to allow us to turn it on for a few minutes each day to “restock” our water supply. All this time without working faucets has got me to thinking about disasters in much greater detail. I also have a much better understanding of how much water you HAVE to have each day to get by. It turns out that the recommended 1 gal per person per day is actually a bare minimum. We have found that, even if you aren’t taking showers or flushing toilets, you will need closer to 2-3 gallons per person per day. Add toilets and basic personal hygiene (but still no showers) into the equation and you need more like 5-10 gallons per person. Wow, what an eye opener. Think about it, do you even have enough room or containers in your house to store 10 gallons of water per person for one day, let alone a week? Puts things into perspective doesn’t it? Of course, not all water is created equal. The quality of the water coming through our broken pipe in not drinkable, so we’ve had to use a purification system to make sure we don’t create a “secondary emergency” by getting sick. We’re fortunate to already own a system that will make our water potable, but it certainly isn’t something I would have thought about having in place for this type of situation. My Red Cross disaster training has been really helpful in coping with this situation; it gave me some basic guidelines to follow and some ideas of how to be creative with our resources. But nothing short of going through a situation can really make you challenge your underlying assumptions—many you may not even realize you have. I had never considered how much water it takes to brush my teeth or how to wash my hands one at a time with one hand pouring from the pitcher and the other trying to wash itself. These are only two small things, but there are dozens of small challenges to be overcome without running water, everything from laundry to cooking. I have always thought I would do OK during a zombie apocalypse, but I have definitely reconsidered some of my bravado after this past week. While we’ve done great, we’ve also not been 100% without access to water or other resources. At any time we can get in our car (which has plenty of gas) and drive to the store or go to a friend’s house for water. We have more than enough food and haven’t lost power or heat, all things that can become scarce or nonexistent for weeks on end during disasters (think Hurricanes Sandy or Katrina). So my message to all of you who are enjoying a cozy snow day, is to take a few minutes today to consider what you might do if you lost even one of these precious utilities that we take for granted.